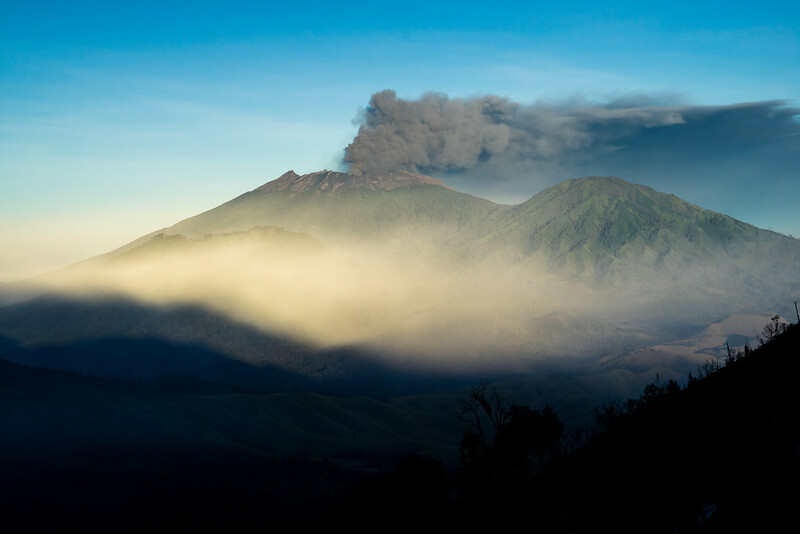 Sitting on the Pacific Ring of Fire, Indonesia is dominated by volcanos. These volcanos are a defining feature of the country. As we traveled around Indonesia, volcanos were not hard to spot. 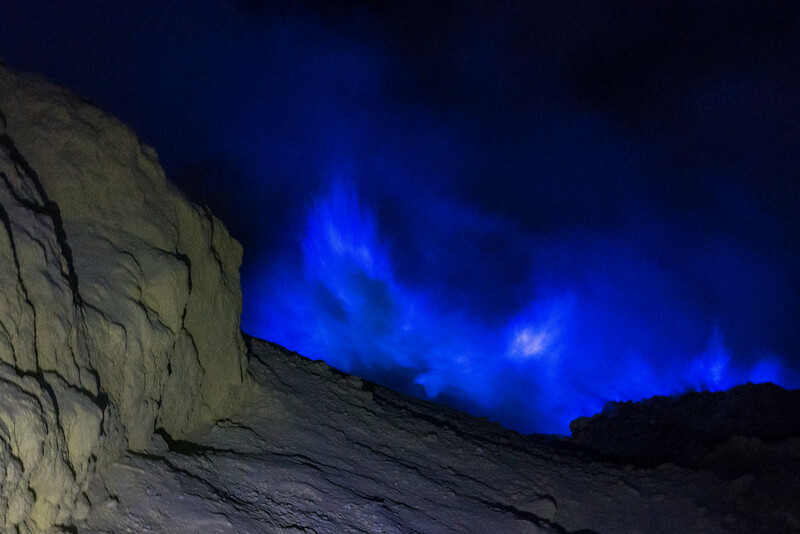 On the island of Java, there was one volcano in particular that stood out to us for its beauty and danger, Kawah Ijen. 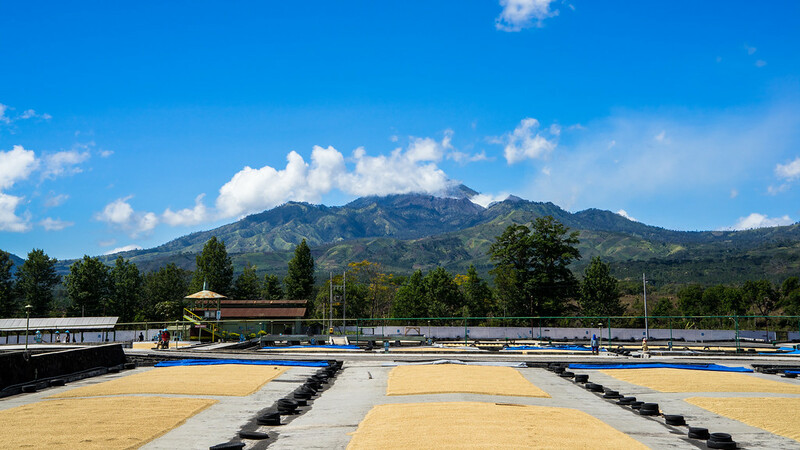 One of the more extraordinary sights in Java. 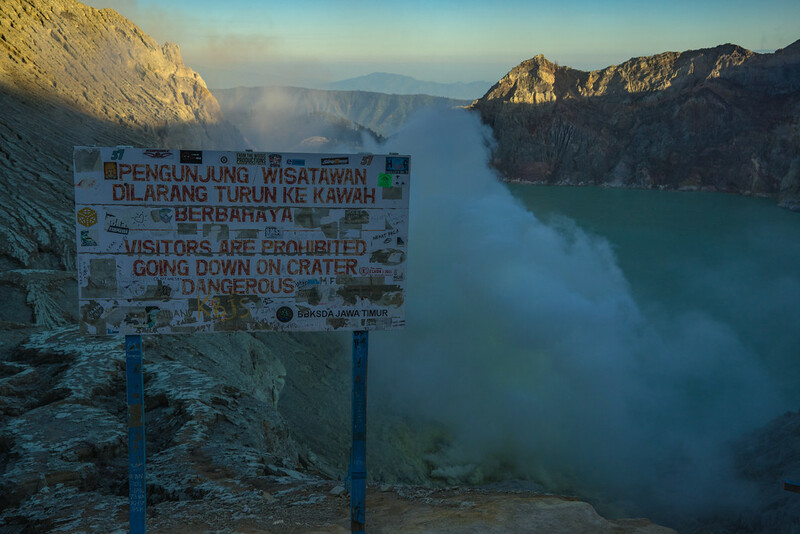 The crater of Kawah Ijen is home to three amazing things we wanted to see up close: blue flames, sulfur mining, and a beautiful turquoise volcanic crater lake. It is a dangerous place to visit but we decided the adventure was worth the risk. 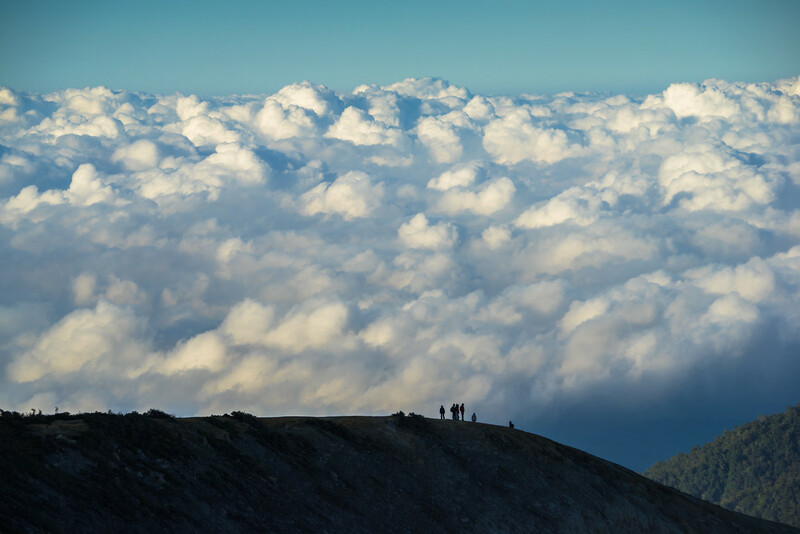 A hike up the mountain and deep down into the crater is the highlight of any visit. 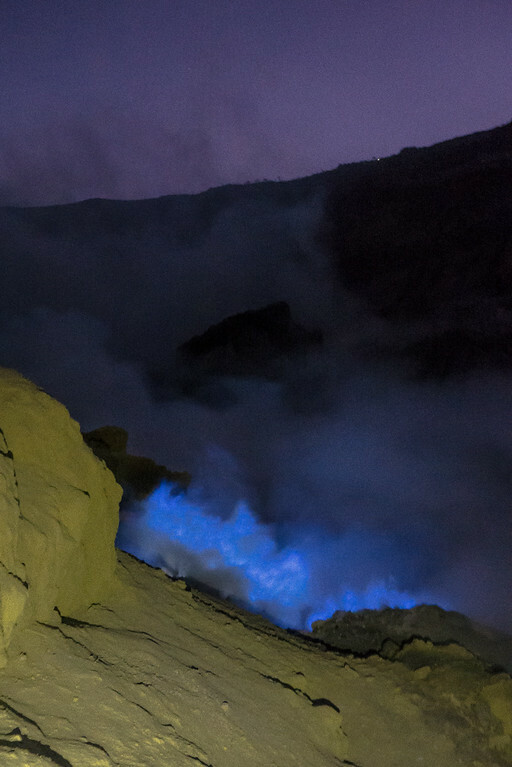 In order to see blue flames, we had to get an early 1 am start for the hike up to the crater. Our guesthouse helped us book a car to take us to Ijen since we were not part of a tour group. 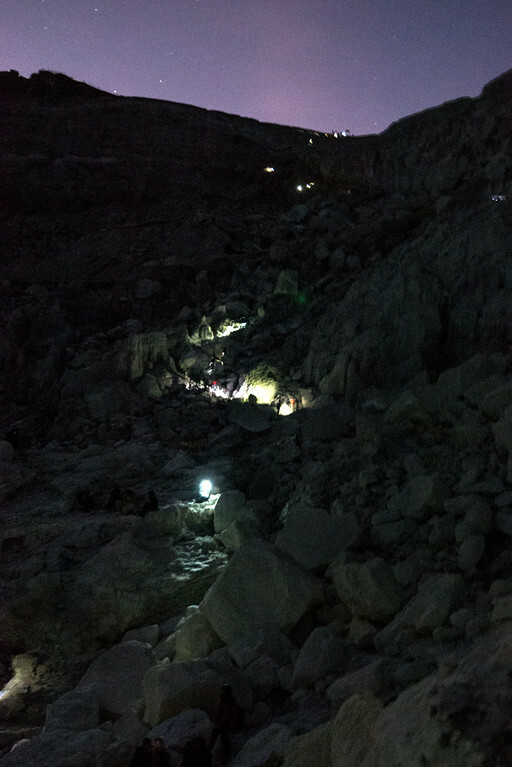 Arriving at the trailhead, we paid our entrance fee (15,000 IDR) and began our hike up the mountain under the stars. The 4 km trek starts off at a steep climb for about the first 1 km but then seemed to level off after that. Needing to take several breaks, we were glad got an early start. Getting to the flames required us to climb for about two hours to reach the rim of the crater. Followed by a 45-minute hike down to the bank of the crater lake. Once we got to the top of the crater and could see the blue flames in the distance. Our excitement rose and we eagerly made our way down into the crater. Scrambling on boulders as we made our way down we came across numerous sulfur miners returning from the bottom of the crater carrying baskets of their sulfur loot. Some of these sulfur miners stopped to show us their beautifully carved sulfur keepsakes which can be used as soap or for decor. We decided to ignore the sign. 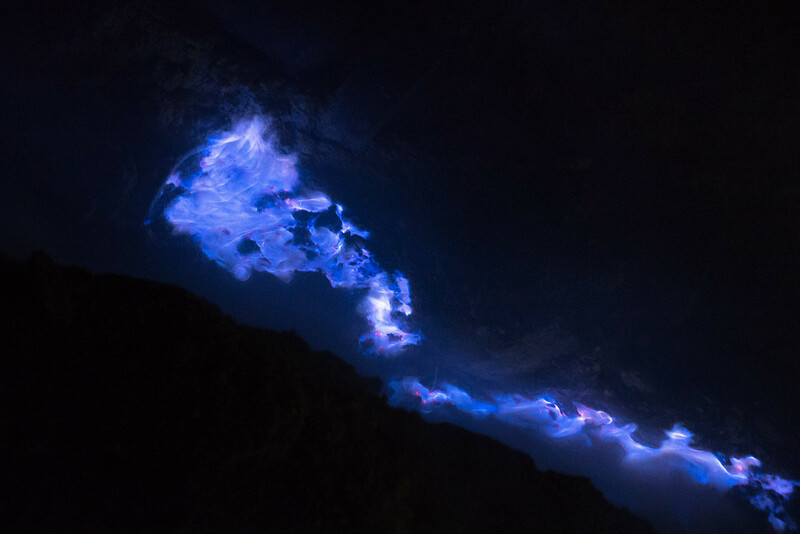 What drew us to Ijen was the electric-blue fire that can be seen in the crater at night. The glow is not really from a fire but from the combustion of sulfuric gas. Emerging from cracks at both high pressure and at temperatures up to 1,112°F (600°C). Sulfuric gasses ignite on contact with air resulting in flames that can be as high as 16 feet. Even though the flames burn day and night, they are only visible during darkness. What makes seeing these flames up close so dangerous is the toxic gas, including sulfur dioxide that rises from vents in the crater. It is advisable to wear a gas mask if you are going to see the flames up close. We didn’t bring any and it was not the smartest thing we did. We were lucky that the gas was blowing away from us most of the time. But when the wind changed direction and the gas surrounded us, it was almost impossible to breathe even with a scarf as a makeshift mask. Wear a respirator or protective face mask. The more effective it filters the air the better off you will be. When we were hiking down into the crater there were a couple of visitors who were affected by the sulfur dioxide gas. We were lucky but I wouldn’t take the chance again. Bring some tiger balm, balm or nasal inhaler with menthol notes to sniff when you feel uncomfortable. You will be scrambling over rocks so be sure to wear comfortable shoes and you may even consider gloves to help. Use a headlamp to keep your hands free. 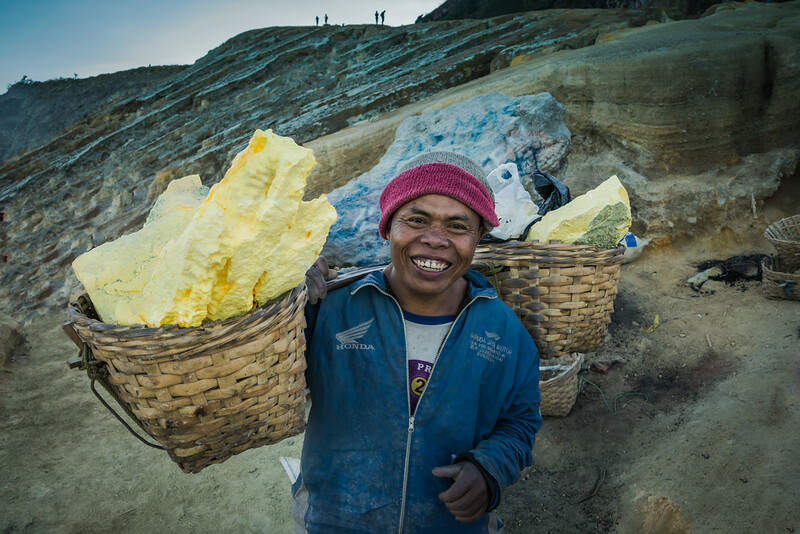 One of more interesting activities taking place in the crater of Kawah Ijen is sulfur mining. 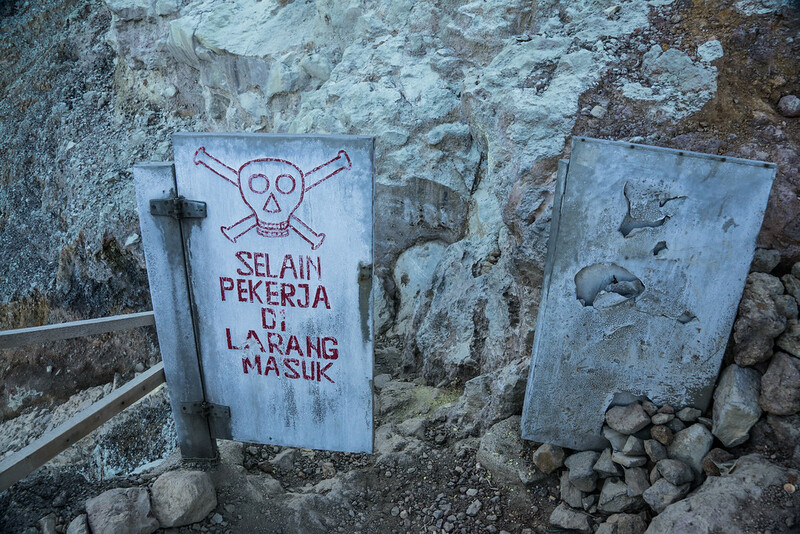 For over 40 years sulfur has been mined from the crater of Kawah Ijen in conditions that can be described as hellish. 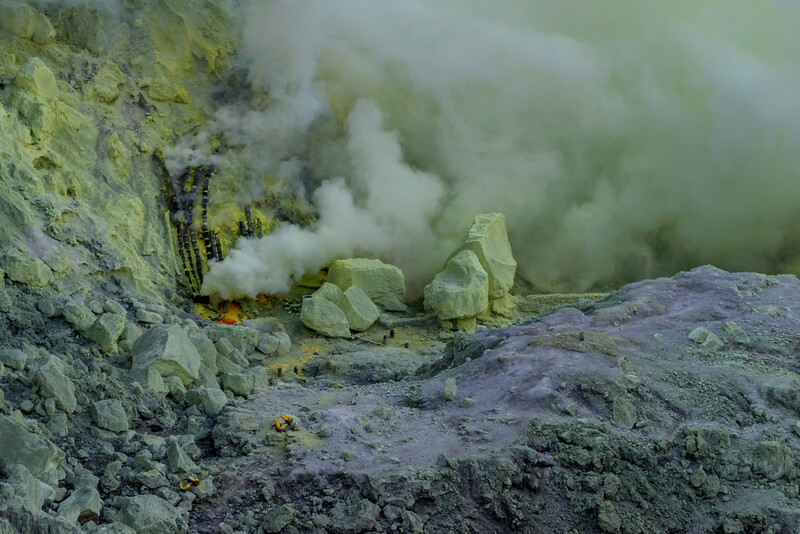 Sulfur deposits form as the sulfuric gasses cool. These cooling gasses condense into liquid sulfur that eventually solidifies. Near the edge of the lake, ceramic pipes have been installed on an active vent that helps to speed up the formation of the sulfur. These pipes route the gasses down the vent’s sloping mound where the liquid sulfur drips from the pipes to form hard sulfur mats after solidifying. Sulfur is a versatile element which is most often turned into sulfuric acid. This is used in a variety of products such as fertilizers, pesticides, beauty products, detergents and cleaners, preservatives, gunpowder, steel, and rubber. 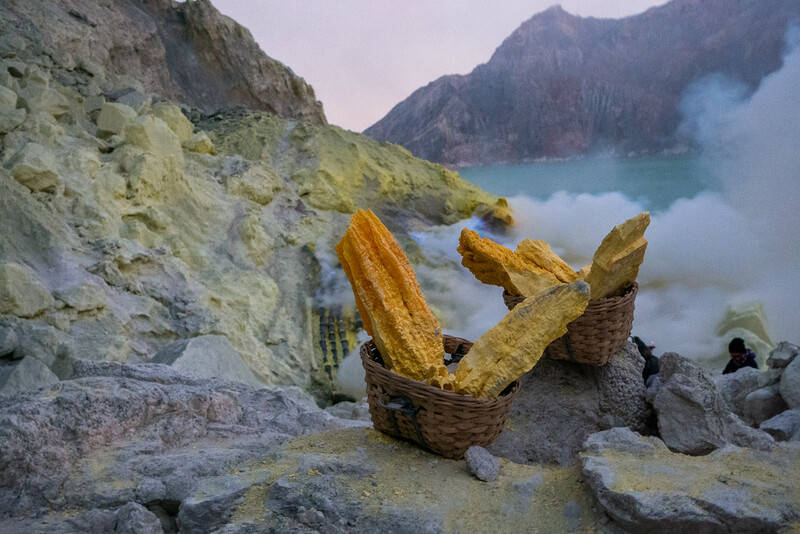 Sulfur in the crater of Ijen volcano. 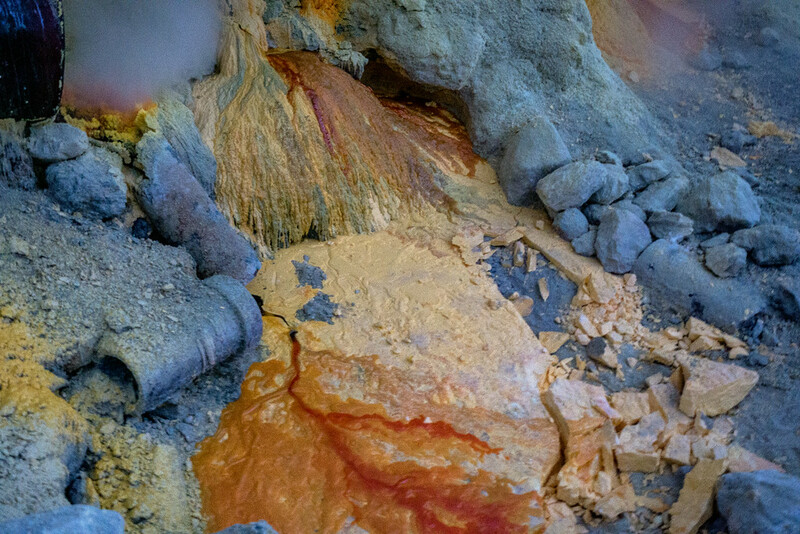 Two baskets of mined sulfur are visible (very small) in the lower left. Miners break up the sulfur mats and haul the chunks of sulfur out of the crater in baskets they carry on their shoulders. Carrying loads of 60 to 80 kilos once a day or twice a day they earn 900-1000 Indonesian Rupiah per kilo for about $5 a basket or $10 a day. In order to get paid, miners have to haul their loads to the nearby Paltuding Valley. This means they not only do they have to haul their loads up and out of the crater but then they carry them 3 km down the mountain road. 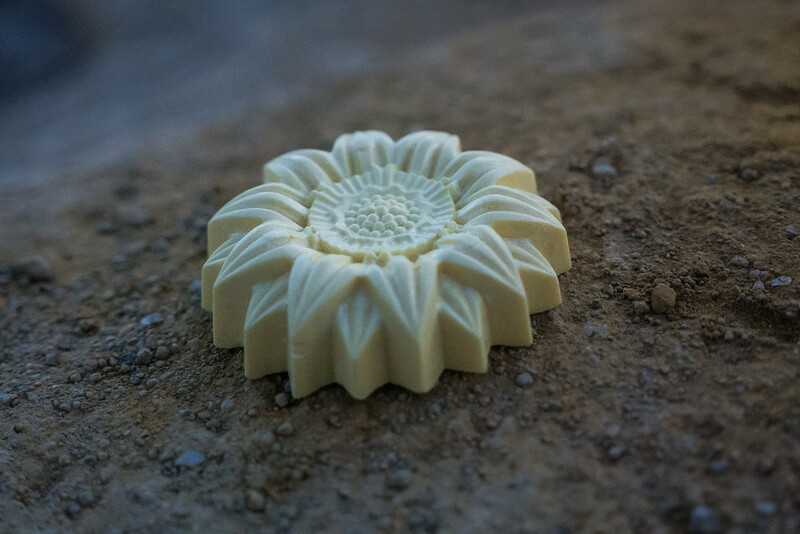 While hiking down into the crater we met a very friendly miner (pictured below) who sold us a beautifully carved sulfur flower. We were happy to have purchased such a unique item from him after talking to him about the difficult job he had. As we were making our way up towards the crater rim he was heading down on his third round-trip journey. He intended on going back a few more times. It is extremely hard work. Miners don’t always have the right protective equipment and are underpaid for their hard labor. Selling tourists souvenirs helps to supplement their small wages. Carved sulfur we bought from the miner. We ended up having to leave behind in another country because it broke. 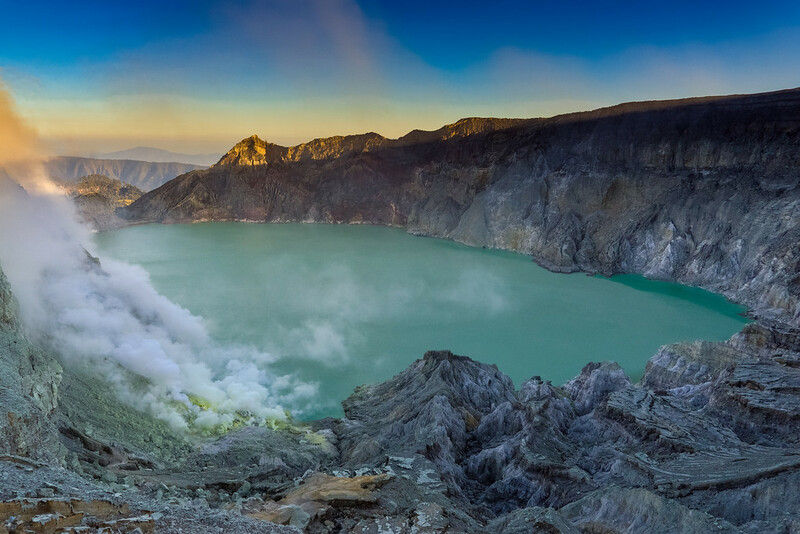 Kawah Ijen Crater Lake is the world’s largest body of water filled with hydrochloric acid. This acid gives the 1 km wide lake a turquoise color and results in a pH of almost 0. Sitting at an elevation of 2148 meters above sea level it is a beautiful site to see. Hydrogen chloride gas emitted from the volcano reacts with the water of the lake to form highly condensed hydrochloric acid. One volcano, Mount Raung, located directly across from Kawah Ijen spewed volcanic ash cloud that shut down airports and left thousands stranded from delayed flights out of Bali. From the top of the crater rim, we got a clear view of nature at work. 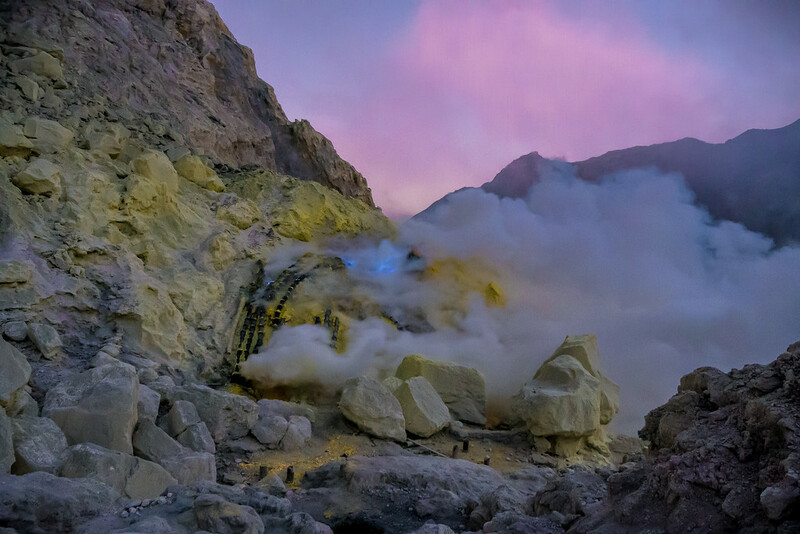 Kawah Ijen’s erupting neighbor, Gunung Ruang. The same volcano that spewed ash for a week and delaying flights from Bali leaving almost 200,000 people stranded. We stayed at the Arabika Homestay which is on a coffee plantation. They were able to book us a car and driver to take us to Kawah Ijen. 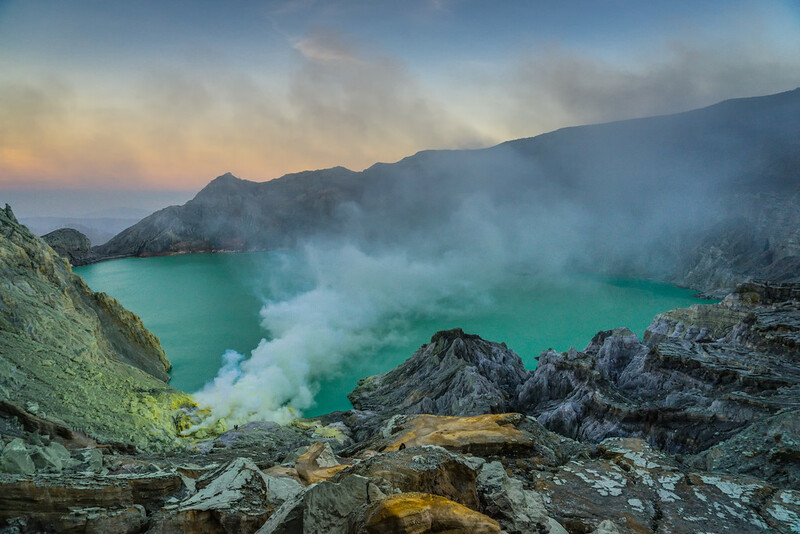 If you want to stay close to Kawah Ijen there are not many options. 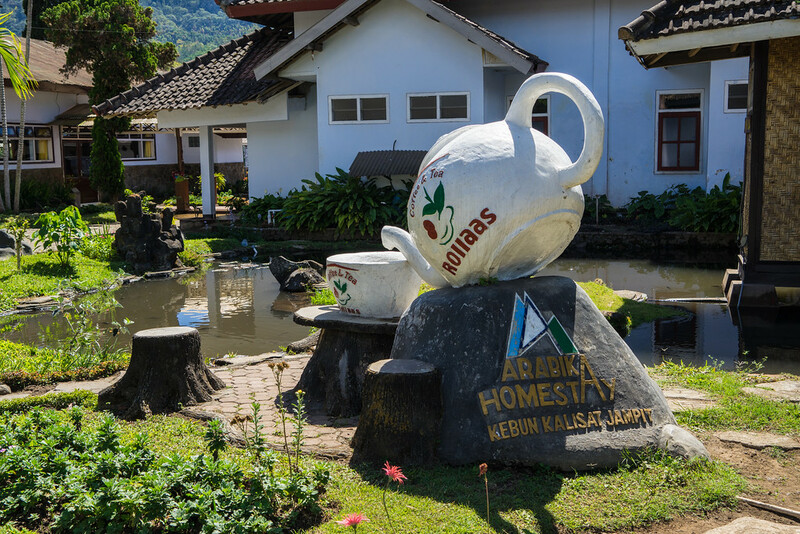 Another nearby option is the Catimore Guesthouse which also on a coffee plantation. With the right guide, it can be easy to go independent of a tour group. We followed this detailed blog post to guide us. Coming from the island of Flores we flew to Bali and traveled overland on a bemo bus from Denpasar to Gilimanuk, then took a ferry to Java. Once we arrived at Banyuwagi on Java, we hired a bemo bus to take us up the guesthouse. We stopped at Catimore guesthouse first but it was booked up so we then went over to Arabika. Our plan was to continue on to Bondowoso and then Cemoro Lawang to see Mt. Bromo. But traveling on the largest holiday celebrated throughout Indonesia posed a challenge and altered our plans slightly. What we didn’t realize was that traveling during the Eid al-Fitr holiday would change our plans. Eid al-Fitr marks the end of Ramadan and many Indonesians travel back to their hometowns. Due to Eid al-Fitr, we were informed by our guesthouse that the normal public transit to Bondowoso would not be running for a couple of days. We hooked up with three French travelers who also needed a ride. Together we managed to find a ride back to Banyuwangi thanks to the guesthouse manager. Once our driver arrived, we crammed into his SUV with one person sitting in the trunk surrounded by all of our backpacks. It was quite an adventure but one of the most memorable parts of our journey. From Banyuwangi we took a train to Surabaya so we could get to our next destination, Mt. Bromo. If you are traveling during Eid al-Fitr it is wise to book tickets ahead of time. Train and air transportation tend to sell out. We were able to get tickets to Surabaya easily. Our French friend who was traveling to Mt Bromo via Jember had to change his plans and go to Surabaya with us. He would have had to wait two weeks if he wanted to go to Jember.